When I saw this page in the Pottery Barn catalog, my heart skipped a beat. Yes, the bedding is lovely, and the windows are pretty, but it was those wreaths that I fell in love with. Amazing!! So, of course, I decided I had to make me one of those "bookish" wreaths. I started by getting me a piece of heavy cardstock (in retrospect, I would actually recommend using heavy CARDBOARD for this project) and drew my wreath base using a plate and a glass for the pattern. Then I simply cut it out. I pulled out my trusty glue gun "Old Blue" and went to work. After dismantling a book that I never read (and never intended to read) I rolled the pages into tight cones, and secured each one with a dot of hot glue, then I started gluing them to the base in a starburst pattern. From there I kept gluing until the wreath was nice and full. I loved the shape, but the pages were too new looking. So I watered down some Raw Umber acrylic paint (when I say watered it down...I mean it was mostly water with a little paint in there) and brushed it over all the pages to create an aged look. Want to see another PB knock-off book wreath? Brenda at Dragonflys and Stars shared her version during the last Frugal Friday Linky Party here at the Shabby Nest! When I saw that page in the PB catalog, my heart skipped a beat or two. 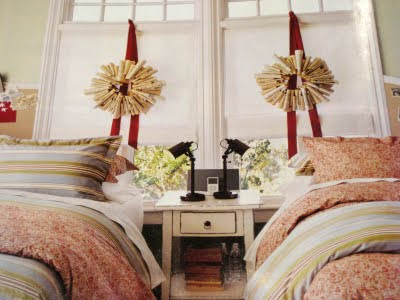 What bedding...I barely notice them because those gorg wreaths are tugging at my heart. Then to see your post on how you made yours (thanks for the details) I just about fell off my chair out of pure excitement! I know what's going on my window this week! WTG Wendy! I love how you see it and immediately get it by making it at home for 1/100th of the price! I would love to fantasize and say I have time to make this, but maybe after the holidays since it isn't holiday specific, it would make a fabulous piece for my wall! Thanks for sharing how you did it!!! It turned out fabulous! OMG! You did an amazing job!!! I need to try one! I'm glad you did this b/c I saw those in the magazine and I was thinking to myself I'd really like to try that but how to start hmmmm? Thanks!!! You did a fabulous job on it....just BEAUTIFUL!! Genius!! this is a great idea! Easy and fast! This is beautiful!!! I've seen them for sale on some sites and they are pretty expensive!!! I like yours better than PB! Great job and soooo easy. Always love your tutorials! I agree with the comment above that yours looks better than the PB one. SO cute and crafty! Man I do love a good craft. Love this! I've clipped and filed that page from the PB catalog for two years in a row now (they had the wreaths in a catalog last year too) and have been pondering how to make one. Love the one that you made! So super cute.Thanks for sharing. Love it! I like yours way better than the PB one. I also wondered how to make it but never took the time. Beautiful job! That looks awesome! It's even kinda snowflakey! So pretty. I'm going to have to try that now!!! It is so pretty! I love the PB calatalog for the ideas, like this one. I never buy anything out of it. Great copy cat version. Sigh... and longing. It is beautiful!! Yours is better! What does the back look like? i love that wreath!!!!! thanks for the great idea. i'm on my way to making one tomorrow!!!!! Wow! I think your wreath looks better than the PB ones. I'm lovin' this idea. Thanks for the inspiration! OOO, you did an amazing job ! !I just love it. I, too, did a post this week about making a wreath, POTTERY BARN style. Don't we all love PB!!! Ooooh, love that! It looks great! awesome! I just did mine today but am also wondering about the back? Did you cover that also? (btw yours is far better looking than mine and the pb one!) Great job! Love this! Thank you for breaking down the process. It's very pretty. I absolutely love the wreaths. Can't wait to make one. I just have to say, yours looks so much better than PB's. Am I going to get into trouble for saying that? I can't wait to make one now. Hopefully mine turns out as good as yours. Thanks for sharing how you made yours. They are adorable!! WOW,... I am excited to make my own. I love yesterdays post. What a fun keepsake from your first home. Be still my heart!!! It's beautiful! Thanks for sharing how you made this! It's so cute. It would also look awesome with sheet music. Super job! I linked to this on my weekly roundup - thanks so much! how did i miss this the first go 'round? I made a few of these and I had forgotten where I saw it originally. When you showed you messy didning room, I spotted it again! I'll make sure you mention where I saw it. I love, love them! here is a link to a blog post of mine from a year ago....you can see my version of this wreath. so much fun!! This is great. It reminds me of what we used to use the old computer punch cards for! Love it.